> Do your honeybees have a water source near by? It’s important that you have a good water source for your bees set up within your apiary. At this time of year your bees will need to eat their winter stored honey which is likely to have crystallised over the winter months. They need water to dilute it back to a base that they can consume easily. That is where you come in! Set up a nice water source near your hives in full sun. This is important as bees are cold blooded insects and need external heat to keep going. Bees have two stomachs. One is used for carrying honey and water, the other is used to digest food. So it they fill up on water and have to travel back very far to their hive, they could become so chilled that they drop due to hypothermia. We recycle discarded old water storage tanks for our sites. They can be dug into the ground as in the photo or balanced ground level. We provide foam and artificial flowers for our bees to land on. 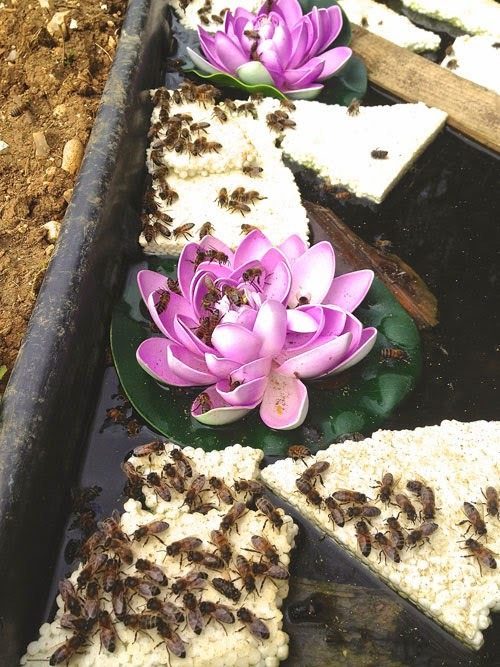 If they fall into the water they can crawl up the foam and out to dry off before flying back to their hive. Once the foam or floating flowers have a bit of moss growing on them your bees will love it. Put a few handfuls of soil and dead wood in the water to enrich it with natural minerals. 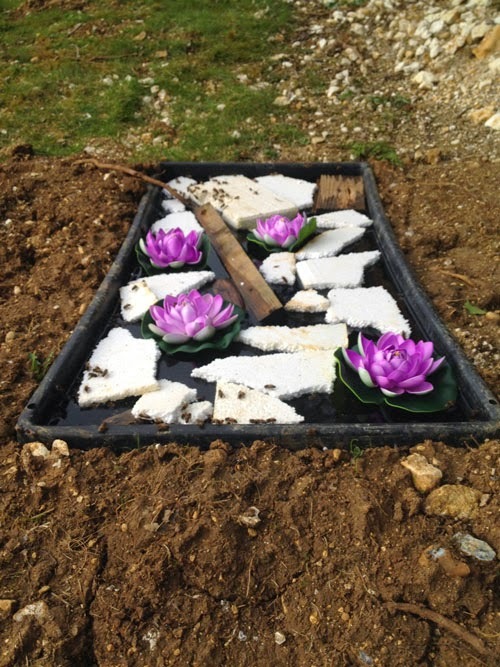 Of course pond plants in gravel baskets look great and the bees will enjoy them too. Bees do not like water that is too clean. Rain water is better than tap water and once the water source gets well seasoned your bees will flock there.